The article in the monthly “Women, Church, World”, remarkable for an official Vatican publication, described the drudgery of nuns who do work such as cooking, cleaning and waiting on tables for cardinals, bishops and priests. It said their remuneration was “random and often modest“. 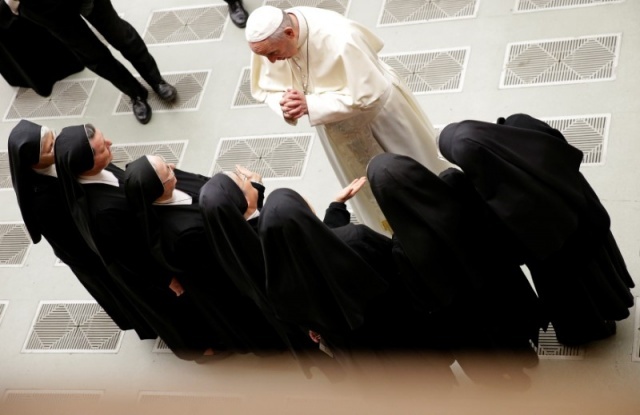 In many cases, the nuns, who take vows of poverty, receive no pay because they are members of female religious orders and are sent to the residences of male Church officials as part of their assignments. In the past, most of the nuns working as domestic help in male-run residences or institutions such as seminaries were local nationals. But in recent years, many have come from Africa, Asia and other parts of the developing world. The magazine, a monthly supplement to the Vatican daily newspaper Osservatore Romano, is written by women journalists and academics. The household of former Pope Benedict, who resigned in 2013 was looked after by about eight female members of a lay Catholic organisation known as Memores Domini. The entire March edition of the magazine is dedicated to the theme of women and work.